Today I broke the law. I visited Bethlehem, which is off limits for Israeli citizens. I went to visit Zoughbi Zoughbi, director of Wi’am (cordial relationships) – Palestinian Conflict Resolution Center (http://www.alaslah.org/). Last night I was looking for directions and could not find them. Who would have known that Google would display the familiar “A” and “B” bubbles and say “We could not calculate directions” for many points in the Palestinian Territories? Who would have known that many spots have two entries, one which says “Israel,” and one which says “Palestinian Territories?” Even when clicking on the latter, the map ultimately shows it all as Israel. Referring or not referring to the place as “Palestine” is a significant choice. All names here are political statements. No choice is innocent. Who will I alienate by my choices? The meeting place Zoughbi suggested, the Everest Hotel and Restaurant in Beit Jala, is still accessible from both sides. Prior to the establishment of the wall, the Everest was a bustling business and a well known place for connection between Israelis and Palestinians. Today, when I got there, it was almost totally deserted. The road that goes by Beit Jala from Jerusalem goes through a checkpoint on the way to a variety of Jewish settlements. The turn to Beit Jala is only accessible from the other direction. One can easily not notice it even exists. Fewer Israelis are willing to find their way and take the small risk of going there. One more blow to cooperation between the two nations. Even before crossing, the gap between the two societies is evident. The Arab towns, even within the borders of Israel, are usually built on the sides of the hills, caressing and snuggling the landscape. Open areas are terraced, and often punctuated with olive trees. The Jewish settlements are often perched on the hilltops, scarring the landscape, prominent. I find it hard not to interpret them as making a statement about who is bigger and stronger around here. I work hard to just notice, without interpreting, without judging, and to keep on loving everyone. The Jewish settlements and so-called “neighborhoods” out of Jerusalem have well-paved roads, clean streets, airy apartment complexes. The Arab towns only minutes away are run down and lacking in resources, requiring endless creativity on the part of the people living there to meet basic needs. And then there’s the infamous wall. I had heard and read some about it. I knew of its existence and of the depth of resistance to its construction, even among many Israelis. None of this prepared me for the visual, on-the-ground effect of standing next to it and seeing the damage. Wi’am itself operates from within a remodeled old building which is right next to the wall. When Zoughbi took me on a ride around town in Bethlehem, the wall was all over the place, towering at about 20 ft or so, cutting right through major areas, reducing formerly upscale wide roads to narrow alleys with deserted businesses, and causing real estate prices to drop dramatically. Some businesses, homes, and farming lands are now on the other side of the wall, confiscated, entirely inaccessible. So much land has been taken, so many olive trees uprooted, that a grocery store owner told me for the first time they are even importing olive oil, a Palestinian mainstay product. This side of the wall has hundreds of drawings and statements on it, mostly done by foreign groups, mostly about peace and human rights. I wonder what’s painted on the other side, and almost wish not to know. All day long I wonder how the people of the settlements live with what they see. What kinds of stories can they tell themselves that make it OK to create a living prison behind a wall? Even though I am troubled by people living in these settlements to begin with, I also completely understand and appreciate their fear, their pain at family members and friends being killed through acts of terrorism originating in the Palestinian Territories. I know I want security and well-being for them, too. I still can’t see it, because security in and of itself could not account for places where a town is cut in half on two sides of the wall, or for the million indignities Palestinians suffer on a daily basis. Michael, Zoughbi’s brother, told me that in order to live one must suppress the pain, or else one cannot continue to exist. I think of the cost of suppressing pain. Zoughbi tells me of the deterioration of physical health in the Palestinian community which he attributes to the stress of occupation. His website tells of their work to address conflicts within the Palestinian community, and traces the roots of such conflict to the economic, environmental, psychological, and spiritual consequences of the prolonged occupation. I am here for one day and my heart is crumbling. How do they survive this, day in and day out? Meanwhile in Tel-Aviv life goes on. It takes conscious and systematic effort if you live in Tel-Aviv to remember, to see the effect of the occupation, to be open to the suffering of Palestinians. Even if awareness is there, the sense of helplessness to do anything about the situation probably keeps everyone focusing elsewhere. I so wish for a vision, some way for ordinary people in Israel to be able to create change. Towards the end of my visit I sit with Zoughbi, an intern from the Netherlands, and a local person who works at Wi’am. We eat hummus and falafel, and dip pita bread in olive oil and za’atar. Simple, scrumptious, familiar. Zoughbi reminds me that even in the midst of occupation and suffering life goes on. He appears happy with what the new prime minister is doing in this imaginary state without power and authority to run its business in full. People’s daily living conditions are improving some, and Zoughbi thinks that conditions are ripe to make peace. Will the Israeli government find ways of moving toward peace? I tell everyone at the table my conclusion for the day: I am impressed with anyone living under occupation who manages not to hate the occupiers. Wi’am gets most of its funding from foreign foundations, and continues to invest in the building and its surroundings to create a haven for the local population. Outside, right in front of and next to the wall and an observation tower, overlooking a refugee camp, and under the gaze of a Jewish settlement, a playground was recently built, as well as a little garden with several sitting areas. Let life happen. Inside, I see many artifacts for sale created by jobless women as part of another Wi’am project. I bought an embroidered money pouch, a couple of books, and 10 copies of one of Wi’am’s cards. 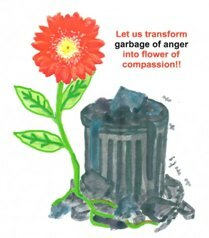 The card says “Let us transform garbage of anger into flower of compassion.” May it be so. This entry was posted in Uncategorized and tagged conflict resolution, israel/palestine on January 22 / 2011 by Miki. Every word you wrote is what I experience and feel every day, and find myself alone trying to express even minimally in my own little living-corner in Israel, far from where you visited, yet part of the same reality, from another angle. thank you for this posting, this little witnessing into the suffering of occupation and the struggle for an open heart. I saw the film Budrus last week, and was tremendously moved by this nonviolent struggle against the wall. I am moved beyond words, weep at the tragedy and long for the flower of compassion to bloom.